Engineered Composites have actually been in use for thousands of years. Adobe bricks were made using a composite of mud and straw. It is the combination of the physical properties of each material that gives the composite material many of its physical characteristics. Today’s advanced composites, like carbon fiber, bring together combined properties we’ve come to know – lightweight, strong, durable and heat-resistant. Today, the benefits of components and products designed and produced in composite materials – instead of metals, such as aluminum and steel – are well recognized by many industries. MSC Software’s extensive solution capabilities in composites help to analyze and enhance complex composite designs. The tools offered by MSC are ideal for numerous types of composites, namely, advanced composites, sandwich panels, plastics, nano composites, hard metals and more. Aerospace & Defense: Engine nacelles, ailerons, radomes, aircraft panels, floors, doors, heat shields, wing structures, rudder, helicopter fuselage, rotor blades, ballistic protection. Automotive: Body panels, chassis, bumpers, brake rotors, cockpit, trimming, instrument panels. Consumer Products: Sporting goods, packaging, heat sinks for electronic systems, bicycle frames, helmets, furniture, building materials. Energy: Wind turbine blades, solar panels, offshore structures including thick-walled tubular, sub-sea pipes, and tanks. Identifying and dealing with manufacturing problems at the design stage, saves considerable cost downstream. For instance, many composite components require draping of multiple plies over curved surfaces. This could lead to material shearing, excessive stretching and a marked change of fiber orientation. Excessive shearing can lead to manufacturing difficulties, and if the fibers deviate considerably from the desired orientation, it could lead to a compromised structure. MSC algorithms, deal with this problem by helping predict the fiber orientations and shear of unidirectional and woven plies as they drape around curved and complex surfaces. With MSC Software’s solutions, you can study the behavior of composite structures across the loading spectrum. 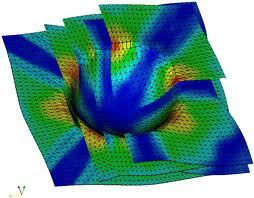 You can perform both linear and nonlinear analysis to predict the response of these structures accurately. Easy to use contact set up saves you significant modeling effort, while providing the robustness and accuracy you require in designing composite structures. Due to the heterogeneous and layered nature of composites, multiple failure mechanisms affect the performance of composites during service. The damage buildup can be gradual leading to performance degradation and to ultimate failure. Progressive Failure Analysis: Predict progression of damage in the materials using any of the multiple failure criteria including Maximum Stress, Maximum Strain, Hill, Hoffman, Tsai-Wu, Hashin, Puck, Hashin-Tape or Hashin-Fabric. Delamination: Analyze weakening and failure of bond between the plies using Cohesive Zone Modeling technique. 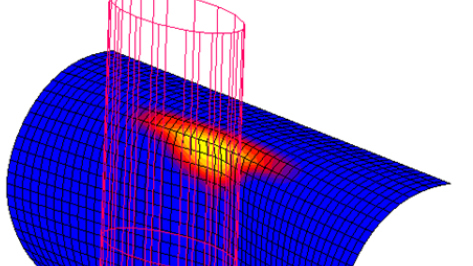 Crack Propagation: Simulate crack propagation using Virtual Crack Closure Technique (VCCT) to design products with better crack growth resistance. Composite materials can be engineered to suite specific applications. However, trial and error designs with physical prototyping can be very expensive. MSC's design optimization solution enables users to optimize their designs and save material costs, by minimizing weight and solving for individual ply thickness and orientations. By taking advantage of a complete suite of optimization capabilities, that include shape, sizing and topology optimization, users can innovate faster. Digimat, lets engineers do both micro- and macro-scale analyses of composites - to calculate their mechanical, thermal and electrical properties for use in all sorts of downstream FEA analyses. For instance, in the case of molded materials, engineers typically start modeling by gathering material information and strand orientation data from Moldflow, 3D-Sigma, Moldex3D, Simpoe or another injection molding simulation solution. 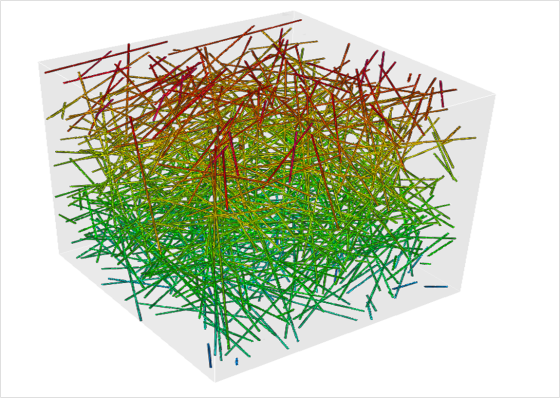 Digimat-MAP calculates residual stresses and temperature from the injection molding mesh and defines an ideal structural FEA mesh. From here, engineers can import these parameters into a commercial FEA program, like MSC Nastran or Marc. They may also use Digimat’s MF, MX, FE modules to look at test data for the composite and its constituents and look at promising material candidates.